The banh mi roll looks like an undistinguished supermarket baguette, a side split bun, something straight out of the toaster at Quiznos. It's slathered with sweet, slightly garlicky mayonnaise and stuffed with your choice of fillings, which include Vietnamese ham, head cheese and pate, shredded pork, curry chicken, tofu. Then it's topped with matchsticks of pickled carrot and daikon, whole sprigs of fresh cilantro, and cucumber spears. If you say you want it spicy, you won't be disappointed. You'll get thinly sliced jalapenos or small red bird chilies with the seeds intact. After a drizzle of fish sauce or soy sauce, the cook slips the sandwich into a small paper bag, then into a larger paper bag. All yours, amazingly, for about the price of a hot dog. Sadly there does not appear to be any Cambridge bánh mì shops that I can find, but we're always looking for an excuse to drive over to Allston for Super 88 and filling baskets full of interesting things whose labels we can't read... now we can make a point to get sammiches too. 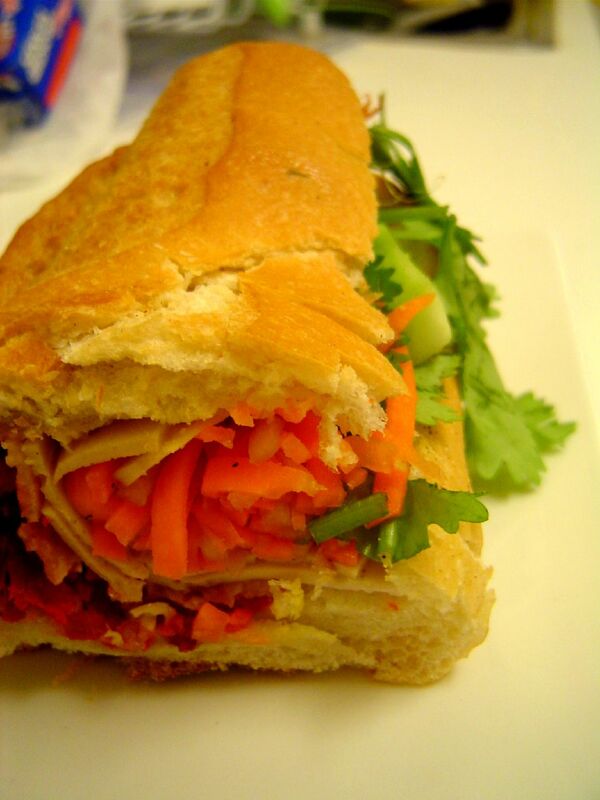 Not to mention that with the weather getting warmer, a trip to Chinatown for bánh mì followed by a meal and walk in the Common is an attractive idea. Consider it another food project.